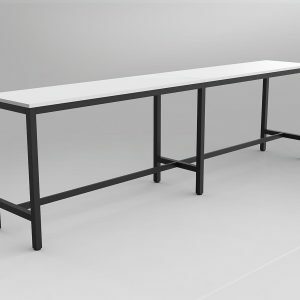 Axis Long Bar Leaner Table layout 1025mm high. Overall size of 3060mm x 600mm. Black Powdercoated 50mm x 50mm frame, 50mm x 25mm rails to all sides, central foot rail 350mm above floor. Two 25mm Studio White worktops, ABS edge. 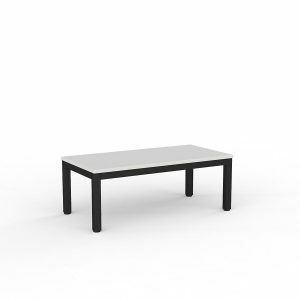 Axis Coffee Table with worktop size of 600-1200mm x 600mm. Black Powdercoated 50mm x 50mm frame 450mm high, 50mm x 25mm rails to all sides. 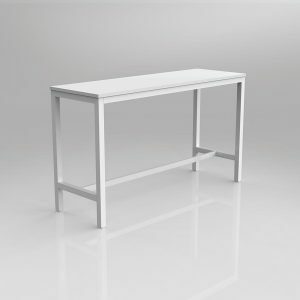 25mm Studio White worktop with ABS edge. 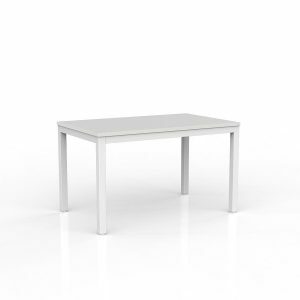 Axis Meeting Table with worktop size of 1200 – 2400mm x 600 – 1200mm. White Powdercoated 50mm x 50mm frame 715mm high. 50mm x 25mm rails to all sides, 80mm height adjustment in each foot. 25mm Studio White worktop with ABS edge. 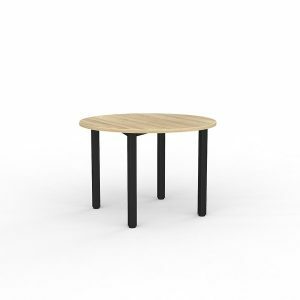 Axis Meeting Table with worktop size of 900-1050mm diameter. Black Powdercoated 50mm x 50mm Post legs 715mm high. 80mm height adjustment in each foot. 25mm Studio White worktop with ABS edge. 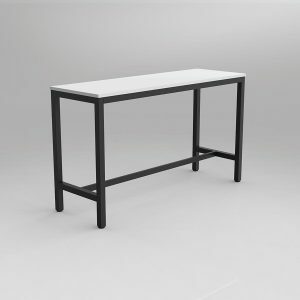 Axis Bar Leaner Table layout 1025mm high. Worktop size of 2100mm x 900mm. Black Powdercoated 50mm x 50mm frame, 50mm x 25mm rails to all sides, central foot rail 350mm above floor. 25mm Studio White worktops, ABS edge. 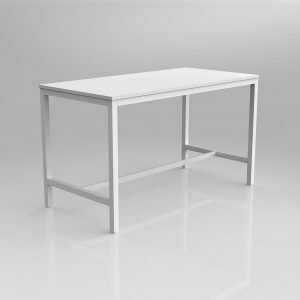 Axis Bar Leaner Table Frame 1025mm high to suit Worktop size of 1500mm x 750mm. Black Powdercoated 50mm x 50mm frame, 50mm x 25mm rails to all sides, central foot rail 350mm above floor. 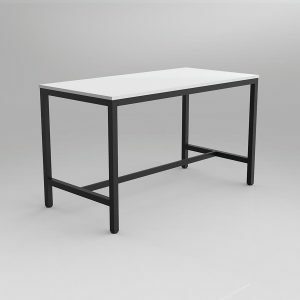 Axis Bar Leaner Table layout 1025mm high. Worktop size of 1800mm x 600mm. White Powdercoated 50mm x 50mm frame, 50mm x 25mm rails to all sides, central foot rail 350mm above floor. 25mm Studio White worktops, ABS edge. 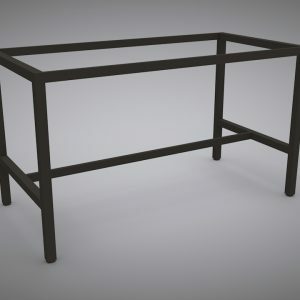 Axis Bar Leaner Table layout 1025mm high. Worktop size of 1800mm x 600mm. Black Powdercoated 50mm x 50mm frame, 50mm x 25mm rails to all sides, central foot rail 350mm above floor. 25mm Studio White worktops, ABS edge. Axis Bar Leaner Table layout 1025mm high. Worktop size of 1500mm x 600mm. White Powdercoated 50mm x 50mm frame, 50mm x 25mm rails to all sides, central foot rail 350mm above floor. 25mm Studio White worktops, ABS edge.